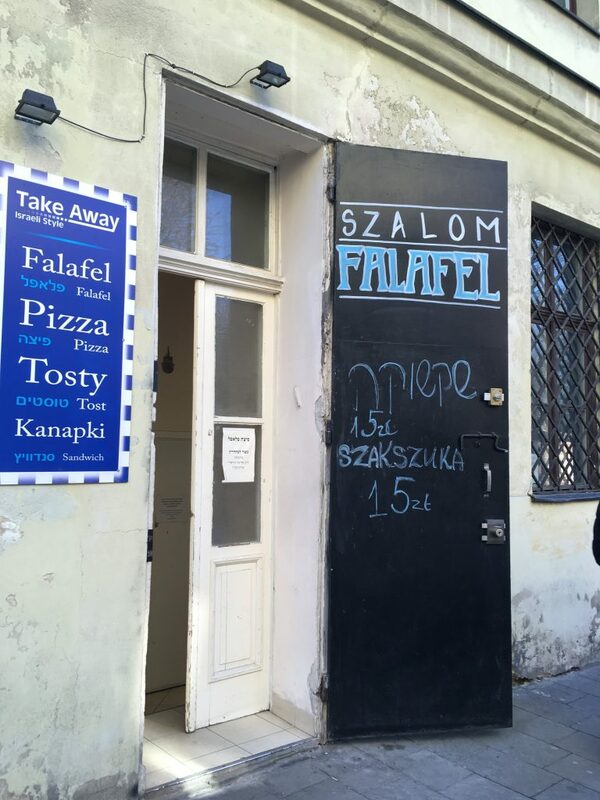 Szalom Falafel is the only walk-in kosher eatery in Krakow, located in the back of the Isaac Synagogue at 21 Jakuba St. It is very small with limited seating, but the food is decent and cheap. They have falafel, French fries, pizza, and eggs. Always call for hours and opening times as they can be subject to change. You can also pre-order sit down meals with caterer Kosher Delight. They have two locations in Krakow; one in the Isaac Synagogue on 18 Kupa St., and one at 10 SW Stanislawa St. This second location was the sight of the first Bais Yaakov building and has a memorial plaque on the front. They don’t give you a choice of dishes (other than choosing meat or chicken) as it’s more set up for catering, but they were more than willing to serve us as they did in Warsaw and Lublin. They charge about $25 per meal. This is rather pricey for Poland, which is a very cheap destination overall since the country is not on the euro. 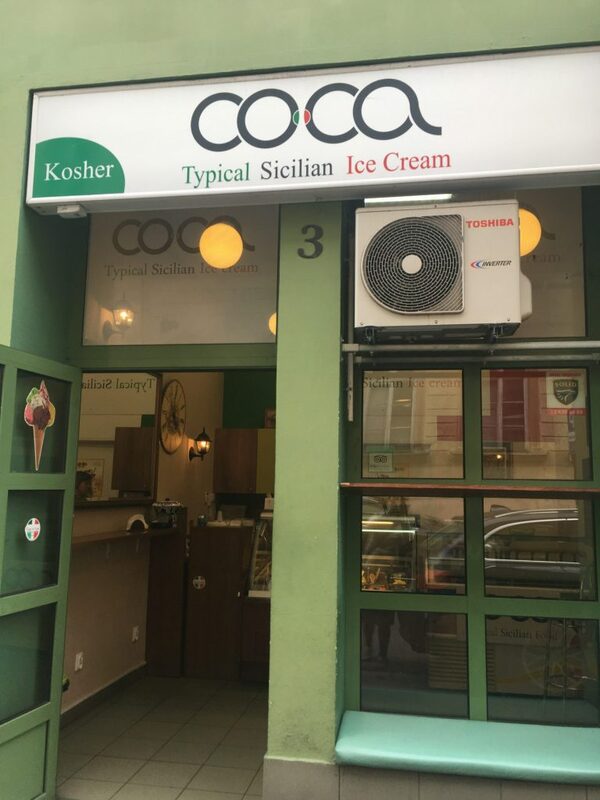 Coca Sicilian Ice Cream is kosher, but may only be open in Spring and Summer. There is a tiny kosher shop in the front of the Isaac Synagogue with a small selection of grocery items. All UHT milk without additives is kosher. For fresh (ie refrigerated) milk, OSM Garwolin milk 2% and 3.2%, and Mlekovita milk 2% are kosher. A list of kosher products in Poland, including Wawel chocolate, can be found here. Krakow today is the center of Jewish life in Poland, much more so than Warsaw. You can see many religious Jewish people walking around, including those with Kippot who are clearly and openly Jewish. The Jewish section of Krakow is called Kazimierz. The neighborhood (formerly a separate town) is named for Polish King Casimir the Great who invited the persecuted Jews from Europe to come to Poland and settle freely in Kazimierz. There are at least three active shuls in Kazimierz and a few others that are either museums or still used as shuls for a total of seven — unmatched anywhere in Europe except for Prague. In Szeroka Square you can find the shul and cemetery of the “Remuh.” The shul itself dates back to the Rema, and he is buried in the adjacent cemetery which is worth a visit. The shul is restored and is open for Shabbat services. The surrounding square is full of “Jewish” themed restaurants and bars, and Klezmer music can be heard at all hours of the day. Though they are covered in Jewish symbols and imagery, it is important to note that none of these are at all kosher and they are not owned or run by Jews. It is something of an inauthentic tourist attraction for those looking for the Jewish Krakow of pre-WWII and Schindler’s List (much of which was filmed in the neighborhood.) 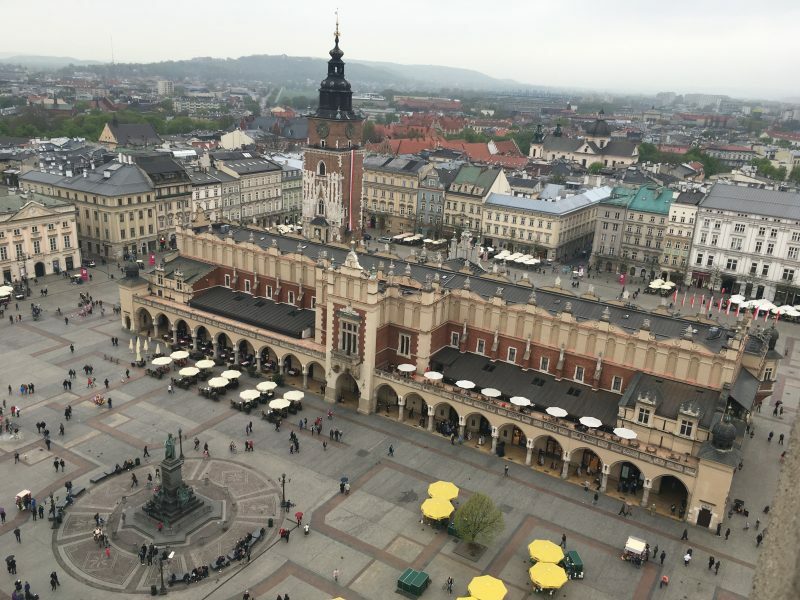 There has been a revival of interest among Poles in the country’s Jewish history since the fall of communism and since the movie Schindler’s List was filmed here. How one feels about seeing these non-Jewish “Jewish” places in the neighborhood is up to the individual. The home that famed Jewish makeup mogul Helena Rubinstein grew up in is also in this square. At the end of the Street is the oldest shul in Krakow which dates back to 1407. It is currently a history museum and not used as a shul. The Isaac Synagogue also has Klezmer concerts and daily services. We davened Friday night and Shabbos at the Rema. A truly wonderful experience. We left shul Friday night serenaded by Klezmer music from the bars in the square. We had meals Friday night and Shabbos day in the Isaac Synagogue, which seemed to get the largest crowd. We did not go to the Chabad. Meals cost $30 per person for Friday night and Shabbos lunch, and $16 for Shalosh Seudoth. Across the Vistula River from Kazimierz you can find the former Jewish ghetto. The main site here is Ghetto Heroes Square which is dedicated to the victims of the Nazis who were kept in this ghetto and then deported to concentration camps. The square today is a large plaza with empty seats, commemorating the strewn about furniture that was all that was left of the Jews after the ghetto was liquidated (an event dramatically depicted in Schindler’s List.) In a corner of the square you can find the Pharmacy Under the Eagle. (Apteka pod Orłem.) The Pharmacy was the only non-Jewish pharmacy in the Krakow Ghetto and was run by a Righteous Gentile named Tadeusz Pankiewicz. During the Ghetto period he managed to stay open, and he and his assistants gave needed medicines and hair dyes (to hide as gentiles) to the Jewish inmates of the Ghetto, as well as papers to help them get out. Just a few blocks away is the Schindler Factory Museum. The city of Krakow has turned the former factory into a museum of the occupation, showing what life was like under Nazi occupation for the three different groups who were there — the Jews, the Poles, and the Nazis. Only a few exhibits are dedicated to Schindler himself. You can see the famous stairs shown in the movie Schindler’s List, as well as his former office and some pots and pans that were made in the factory. Be aware that the line is quite long unless you go with a tour. Wait times can be up to an hour, but it is worth it, as it is a highly evocative museum. One can also visit the former concentration camp at Plaszow, depicted in the movie Schindler’s List. Here you can find the house from which Nazi Amon Goeth used to shoot at victims from his balcony, as shown in the movie. The eerily quiet space is now a vast, open field dotted with memorials. The grave of Jewish women’s education pioneer, Sara Schenirer, can also be found here. 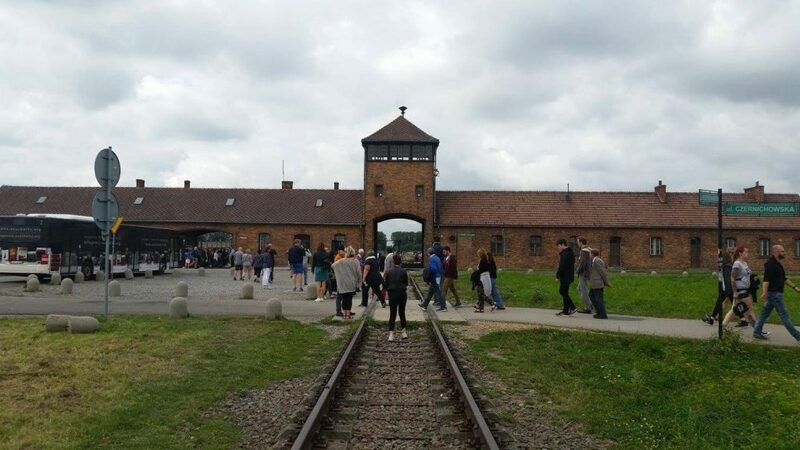 No first trip to Poland should be without a visit to Auschwitz. Krakow itself is a wonderful city to visit, with a lovely old town that can be reached on foot (or by tram) from Kazimierz, and one of Europe’s most beautiful town squares. Krakow was the historic capital of Poland before it was moved to Warsaw, and it retains its old world charm, particularly at the Cloth Hall in the main square. The Wawel Castle grounds on a hill overlooking the old town are also worth a visit. Walking tours are highly recommended, and like many cities there are companies offering “free” (meaning tip based) walking tours on a variety of subjects. 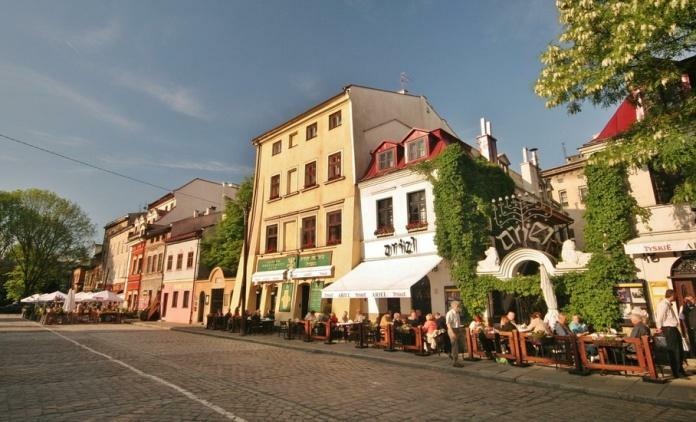 Aside from its Jewish history, Kazimierz is also a trendy, “gritty” neighborhood with a very vibrant nightlife and many great bars and pubs. Nearby, you can day trip to the Wieliczka Salt Mine, a labyrinth of tunnels in an old salt mine where the workers turned the salt into art — sculpting it into statues and even a church made out of salt, complete with salt chandeliers and altarpieces. Krakow has an airport and can also be reached from Warsaw in about 2.5-3 hours on a clean and modern high speed train. Been to Krakow? We encourage our readers to share their experiences and any updates in the comments below.